This book can be categorized as a self-help book. Some people like these kinds of books, others think they are futile. You need to approach this book with an open mind, or else you won't get anything out of it. The fact that Covey manages to translate his message into seven well-described habits makes this book so useful in day-to-day work for me. I often find situations where these habits are applicable. Proactive is to be seen in contrast to reactive. We easily feel victimized by circumstances or blame other people for problems, which is reactive. Symptoms of being reactive are frustration, cynicism or boredom. Covey says that the first step is to take responsibility for your actions and start thinking for yourself. Beware, proactivity doesn't equal doing things for the sake of doing things (Aktionismus). This is a shift of mind first, only the other habits tell us what we can do once we have accepted habit one: You have to get in the driver's seat if you really want to make a difference. This habit includes the ability to make plans. Too often our actions are uncoordinated and not thought through. If you know where you're going, you create a vision, and the vision pulls you towards this goal. This habit is valid for short-term goals (Covey recommends a week as a minumum time span) as well as long-term, personal goals. If you think about it, it's not easy to really give a list of your own long-term goals. A common mistake is to state goals negatively: I don't want my back to hurt, I don't want to be stressed anymore, I want to be done with this piece of work. This is a reactive pattern and contradicts habit one. Goals must be positive. 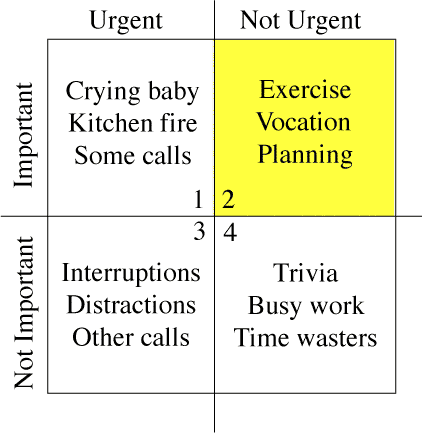 Most of our activity seems to be in the "urgent and important" quadrant (Q1). These things need to be done (as you may have noticed, this is again a reactive pattern). The interesting quadrants are "urgent and not important" (Q3) and "not urgent and important" (Q2): Only activity in Q2 will help us to reduce the workload in Q1 in the long run. As long as Q3 dominates our time not spent in Q1, there will be more crises and more stress. So we need to spend time in Q2 as often as possible, which demands a lot of discipline: A lot of things appear important, although they are not. Q2 also gives you most fun and long-term satisfaction. Spending your time in Q1 and Q3 is the road to burnout. Habit three builds on habits one and two: You must be willing to make a difference and have a plan what you want to change first. While the first trilogy is about yourself, habits four to six deal with relations to other people. Habit four is similar to habit one, as it includes a paradigm shift: Suddenly, there are no more enemies. People who think win/win have an abundance mentality (in contrast to a scarcity mentality), which means that there's plenty (resources) out there for all of us. Covey says that only win/win relationships are long term and thus beneficial. Beware: This habit doesn't just say "be nice to your customers": this would be a lose/win situation. Another point is that you cannot force win/win, so it is good to have a "no deal" alternative to avoid win/lose or lose/win. In the second habit we have established what we determine as "win" for ourselves. Now we need to find out what "win" means to other people. This is a basic requirement for a real conversation. But often, people just seem to say whatever it is they want to say, with no consideration of their counterpart. Imagine business negotiations where you want to sell your product. If you keep on talking about what you have to offer, but do not listen to what the customer really wants, your chances of succeeding are highly reduced. Beware: disagreeing is not contrary to this habit. Being confronted with another opinion gives us the opportunity to reflect and see things from another perspective. This habit is about team work. Habits four and five help us to synergize, to function in teams, where the whole is bigger than the sum of its parts. Being part of a great team is one of the greatest things we can achieve in life. Now you can achieve things that you can't achieve on your own. A real team is an extension of our own self. Where the first trilogy is about being "indepent", meaning being responsible for yourself, this habit implies being "interdependent". This habit is keeping it all together: leading a balanced life which allows us to implement the previous habits. This includes regular physical exercise as well as sharpening the mind by reading or writing.